Churchill Crocodile "Calgary" of 51 Royal Tank Regiment, C Squadron, attached to the 2nd New Zealand Division, sprays flame across the Senio River prior to the Allied crossing on April 9, 1945. The Senio River crossing was preceded by a large aerial bombardment, then 28 Crocodiles and 127 Wasp flamethrower carriers, spaced every 70 yards (64 meters) along a five-mile (8-kilometer) front, burned everything along the line. The 2nd New Zealand suffered no casualties in crossing the Senio. 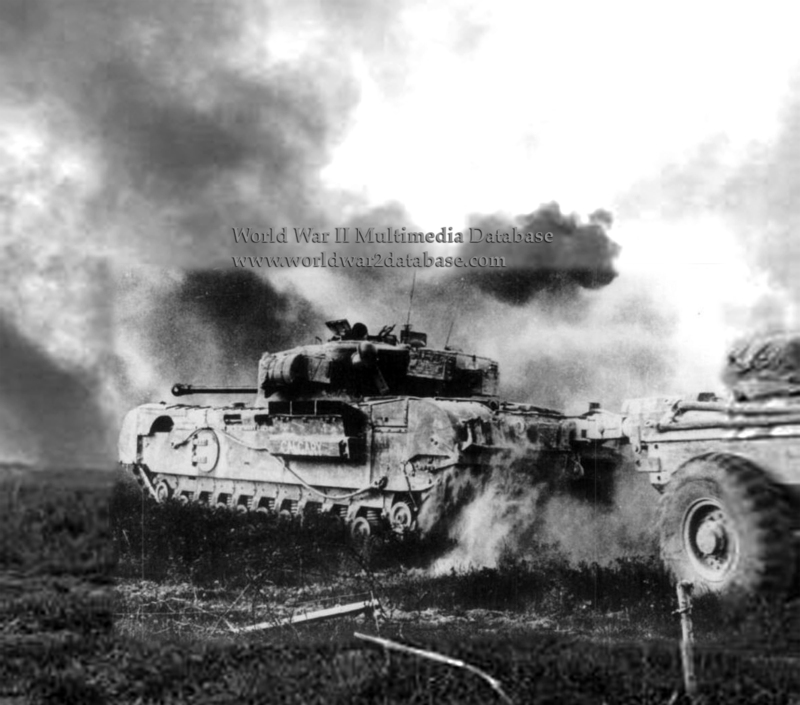 The Crocodile was based on the Mark VII Churchill Tank, and retained a 75mm (3 inch) cannon in the turret with a flamethrower in place of the hull-mounted BESA 7.62mm (.30 caliber) machine gun. Designed by Major-General Sir Percy "Hobo" Hobart (June 14, 1885 - February 19, 1957) famed comannder of the 79th Armoured Division, the Crocodile was one of "Hobart's Funnies" designed for specialized operations during the Normandy Campaign. Only in 1945 were the "funnies" made available to the Italian Theatre of Operations. The unique design - a trailer pulled behind the Crocodile held four hundred gallons (1500 liters) of fuel - made the Crocodile marginally safer than previous motorized flamethrowers, which would burn furiously if hit. The Crocodile used pressurized nitrogen to send flame up to 120 yards (110 meters). The appearance of a Crocodile, or a spray of unignited fuel, would be enough to affect a surrender. Used in concert with the Churchill Armored Vehicle Royal Engineers (AVRE) which mounted a 290mm (11.4 inch) spigot mortar. The AVRE would fire on a bunker, then the Crocodile would flame the debris. There are reports that some Crocodile crews, when their tank was "brewed" or knocked out, were executed immediately by the Germans rather than taken prisoner because of the fear and anger over the weapon. A unit of Crocodiles was sent to Korea in 1950.